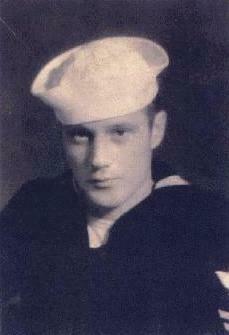 I enlisted in the Navy August 27, 1940 at Portland, Oregon. A neighbor boy went with me. We signed up in May but were not called until August. We went to Boot Camp in San Diego. I was in recruit Company 40-64. We were supposed to have 12 weeks of Boot Camp but for some reason the powers that be said bring the fleet complement up, so we only had five weeks there. We were given transportation to Pearl Harbor aboard the USS Saratoga, an aircraft carrier. I was assigned to the USS Nevada BB36. I served aboard her until Dec. 7, 1941. Most of my daily tasks consisted of working in motorwhale boats. After the Pearl Harbor attack I went aboard the USS St. Louis CL99 a light cruiser. I was aboard the St. Louis until Sept. 1944. We had participated in several sea battles and shore bombardments in the south and central Pacific. The shooting war ended for me at Guam and Siapan. I was sent to oil burning school in Philadelphia. The school was jokingly called Flareback. After the school was over I was assigned to the USS Boxer CV21 a new aircraft carrier. I was aboard the Boxer until Sept.1946. In Oct.1947 I enlisted in the U.S.Coast Guard. I served aboard three 255 foot cutters, two 189 foot buoy tenders as well as duty at Port Angeles Wa. Air Station and a tour of shore duty at the Coast Guard Academy in New London, Conn. I retired from the Coast Guard Sept. 1, 1963 as a Chief Warrant Officer. December 7, 1991 marked the 50th anniversary of the Pearl Harbor Attack. As one who was there, this brings back a lot of memories and thoughts of 50 years ago. On December 1, 1941, I was promoted to Seaman First Class. The first advancement from Apprentice Seaman to Seaman Second Class had been automatic. This time though, I had to put in a correspondence course, pass that, demonstrate an ability to handle the job, be recommended for advancement and then pass a rather lengthy written exam. I was quite pleased with myself, and my salary went up from $36 to $54 per month. All was well and the Navy was a wonderful place for a 20-year old boy from the lower Columbia River country. Much has been written over the years about the attack from learned people and armchair strategists. I can only tell you my experience as one young seaman. At Pearl Harbor, my ship, the U.S.S. Nevada, was the only battleship that was able to get underway. 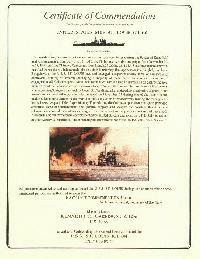 We had opened fire on the enemy and were proceeding down the ship channel. We then received a great deal of attention from the enemy. Sinking us in the channel would have blocked any going in and out of Pearl Harbor for many months. My battle station at this time was on a 5-inch, 25 caliber anti-aircraft gun. Strafers, as well as bomb hits, took a terrible toll on my shipmates. USS NEVADA Long Beach, Calif. In order to avoid sinking in the Channel, the ship, which by now was heavily damaged, was deliberately run aground. We were out of ammunition and helpless. We could only watch the battle as spectators and tend to our wounded. A lieutenant commander spotted me knowing that I was a crewman in the small boats. He ordered me to get a crew together and assist the Ford Island Air Station in any way that I could. It didn't occur to him that my experience was all in 26-foot motorwhale boats. He pointed to a 40-foot motor launch and said, "Take that one." I did not argue and ran the larger boat like a veteran. For a period of time I transported wounded men from the air station. Later, I provided transportation of men and material to various units as needed. In this capacity, my crew and I had the opportunity to see the overall damage that had been inflicted. It was awesome! Much has been made of the fact that it was a sneak attack. As I look back, I doubt if the outcome would have been much different even if we had been warned in advance. My ship was well-armed, well-trained and well supplied to fight in World War I, not a modern war. Our anti-aircraft guns were inadequate for the job and we mere totally lacking in heavy machine guns needed for close-in work at 1,500 yards or less. The motto of the Pearl Harbor Survivors is "Remember Pearl Harbor-Keep America Alert." To this I would add, "And Up-To-Date." Don't send our young men and women to fight any future wars with the last war's weapons. Certificate of Commendation: Click on the image to read.